Annie Howe's sweet scene of love birds and bicycles is personalized with your initials and date of choice. They often biked back to the tree where they made their heartfelt mark. 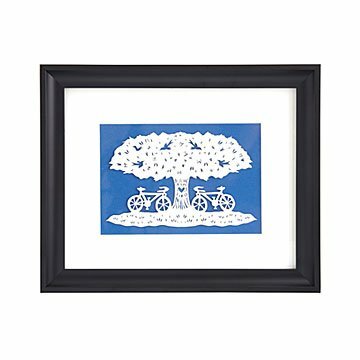 Annie Howe's sweet scene of love birds and bicycles is personalized with your initials and date of choice hand cut into the tree's design. The meticulous composition is a memento of your union, marked by a subtle crease in the middle where the paper was folded as part of Annie's process. It makes a memorable wedding or anniversary gift, especially for the first when the traditional gift is paper. Handmade in Baltimore. Won a place of honor in their new home. I married my childhood sweetheart last year. The look on his face when he saw our initials and wedding date carved into the trunk of the tree was priceless. We gave this to my sister in law and her husband for their wedding, and they absolutely loved it! They are avid bike riders and this was a unique personal gift for them. So excited to have found it for them. I gave this gift to a very dear friend of mine who was married to her childhood sweetheart over the summer. They are very outdoorsy and often take bike rides together, so the design fits them and their interests exactly.